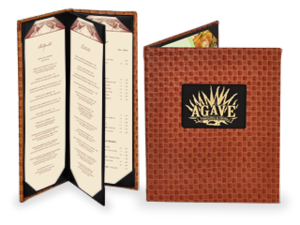 Elevate your elegant restaurant's world-class menu by showcasing your options in our stunning faux leather basketweave menu covers. These polyurethane covers are reinforced by a distinctive woven pattern and optional padding, making them a perfect fit for fine dining establishments that want the look and feel of leather without the cost or maintenance requirements. This material is stronger than any natural fiber and resists food and beverage stains. With a choice of square or rounded corners, faux leather basketweave menu covers can be made to suit your style.The cover material is too stain-resistant to accept any decoration added to its surface, but an optional picture window allows you to show off your full-color name or logo under a protective layer of clear vinyl. 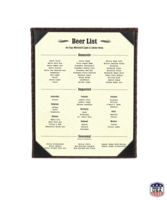 Fine dining restaurants attract diners who want a sophisticated ambiance and gourmet menu items, and these menu covers are the finishing touch you need to provide both. Each menu cover will last at least 5 years, thanks to a hardcover-quality binding process and thick, reinforced polyurethane material. Because this high-quality leather alternative is woven and laminated, maintenance is a breeze. Simply wipe each cover off with a damp cloth at the end of the night, and use a mild dish soap solution to easily remove hardened food particles. 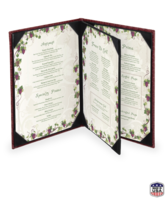 Each style comes in unlimited sizes and four distinct menu types: single, double, four-view, and six-view booklet-style designs. You have the freedom to use menu inserts of multiple shapes and sizes. It's easy to match these menus to your decorating scheme, too. Choose one of eight different color options free of charge, including nutty brown tones that pair well with wooden furnishings and deep, sophisticated bordeaux that captures the sensual appeal of red wine. Mid-range to high class. 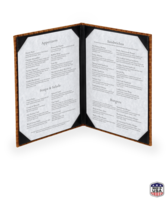 These high quality menu covers are available at midrange prices thanks to durable polyurethane that mimics the strong, soft texture, and exotic look of genuine woven leather. 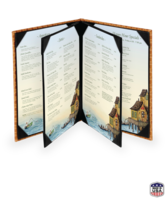 When your diners hold these striking menu covers in their hands, they will instantly know your standards are high and your restaurant plays close attention to every detail. Give your carefully crafted menu the spotlight it deserves with our fine collection of faux leather basketweave menu holders. Take your leather menu covers to another level with this unique basketweave pattern beautifully crafted from the finest leather we could find.